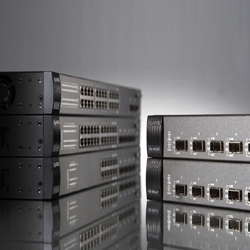 Designed to be installed in heavy industrial demanding environments, the IGS-4215-4P4T2S is the new generation of PLANET Industrial-grade, DIN-rail type L2/L4 Managed Gigabit PoE+ Switch featuring PLANET intelligent PoEfunctions to improve the availability of critical business applications. It provides IPv6/IPv4 dual stack management and built-in L2/L4 Gigabit switching engine along with 4 10/100/1000BASE-T ports featuring 30-watt 802.3at PoE+, 4 additional Gigabit copper ports and another 2 extra 100/1000BASE-X SFP fiber slots for data and video uplink. The IGS-4215-4P4T2S is able to operate reliably, stably and quietly in any environment without affecting its performance. It comes with a total power budget of up to 144 watts for different kinds of PoE applications and operating temperature ranging from -40 to 75 degrees C in a rugged IP30 metal housing. *** Runs on -48VDC - Requires External 230VAC supply if mains powering is required.